Home / Food Tips / Do You Make These Mistakes When You Buy Olive Oil? Mistake #1: Buying stale olive oil “off the shelf.” Olive oil, unlike wine, does not get better with age. Like milk, eggs, meat, and many other foods, olive oil is perishable. The olive is, after all, a fruit. Similar to other fruit juices, olive oil is best enjoyed fresh-squeezed. That’s when you experience its peak freshness, flavor, and nutritional potency. Our recommendation: We avoid buying olive oil in stores, where the oils can sit on the shelf for months, growing stale, musty, and eventually rancid. We much prefer buying online, where you can secure outrageously delicious olive oils fresh from the latest harvest. That’s when olive oil is bursting with just-plucked-from-the-tree flavor and goodness. Try just one bottle of such fresh-pressed olive oil from a good online source, and you’ll likely never go back to store-bought. Below we name our favorite online source of harvest-fresh olive oil. In fact, to introduce you to their fresh-pressed ­olive oil, they’ll even send you a bottle of their finest artisanal olive oil (normally $39)—direct from the new harvest—for just $1. It’s quite a generous offer. If you’re interested, click on the link at the end of this article. Mistake #2: Unwittingly buying olive oil made by the Mafia. In recent years, many of America’s most respected media, including Forbes, The Wall Street Journal, and CBS News and scores of others have reported the appalling news that many olive oils in the US are cheap counterfeits made by the Mafia. For example, last year 60 Minutes ran an explosive exposé showing how the Mafia has infiltrated the olive oil business, adulterating olive oil with much cheaper ingredients, such as nut and seed oils, to make obscene profits when they sell it as “extra virgin” (the highest grade). 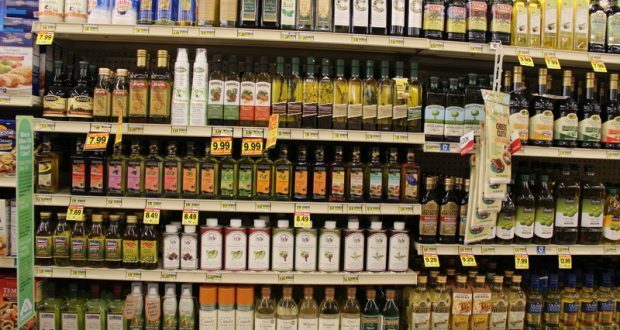 According to 60 Minutes, you now face a “sea of fakes” when you shop for olive oil. This is a serious concern because when criminals make olive oil, they couldn’t care less about your health or your family’s. Our recommendation: You never want to feed your family fake olive oil made by the Mafia. But how can you avoid it? We recommend buying from a supplier who goes the extra mile of having all their oils independently lab certified to be 100% pure extra virgin. The source we recommend below is one such conscientious provider. Mistake #3: Thinking that all olive oils taste alike. If you’ve always bought your olive oil in a supermarket, odds are you’ve never experienced the extraordinary diversity of flavors that await you among the finest artisanal oils. You see, ordinary mass-market olive oils sell in such huge volume, they must combine inferior olives from many farms and different growing regions, with little regard for flavor compatibility. To our taste, this typically results in a dull, lifeless flavor profile. In contrast, award-winning artisans create their oils from olives grown on small, boutique farms. These dedicated masters are free to strive for flavor perfection from each different type of olive. This makes their award-winning creations as rich, complex, and distinctive as the finest wines. For example, some olive varietals naturally possess a bright, spicy flavor. These oils are audaciously bold and pair magnificently with a hearty charred steak or grilled lamb. In contrast, other artisanal olive oils are pressed from olives that yield softer, more delicate nuances. These will perfectly complement—without overpowering—your delicate baked halibut. Still other olives naturally yield a greener, more herbaceous oil that will crown your salad greens and veggies with breathtaking farm-fresh flavor. Discovering and enjoying these amazing differences in fine artisanal olive oils is not only fun, but as any master chef will tell you, it’s one of the great secrets of elevating your favorite dishes to new heights of flavor and satisfaction. Our recommendation: The moment you twist the cap off one of these outstanding just-pressed oils and inhale its harvest-fresh bouquet, you’ll know exactly what we’re talking about. In fact, now you can do it with one of the most divine artisanal olive oils we’ve ever tasted. It’s from the source we recommend below. It’s normally $39 a bottle, but you can try it as part of a special promotion for just $1 to help cover shipping. And you’re under no obligation to buy anything else. A one-time chef and gourmet food writer/editor, T. J. came up with the idea of hunting for the world’s best, freshest artisanal extra virgin olive oils (EVOO)—and flying them directly to the kitchens of America’s top gourmet chefs and passionate foodies straight from the new harvest at their peak of flavor. He does this through his fast-growing Fresh-Pressed Olive Oil Club. Joining the Club gives you direct access to the purest, freshest, and most flavorful olive oils from a wide array of gold-medal-winning olive oil producers. These olive oils are personally hand-selected by T. J. Robinson exclusively for his Club members and are available nowhere else on earth. They are out-of-this-world delicious! And, as we mentioned, when you join, there’s no commitment to buy anything else. With T. J. as your personal “Olive Oil Hunter,” you’ll never again have to worry about unwittingly buying olive oil counterfeited by the Mafia, using fake and potentially harmful chemical additives. That’s because every olive oil T. J. imports is independently certified in two ways to be 100% pure extra virgin. First, each oil is chemically tested by an accredited third-party laboratory and certified to be 100% pure extra virgin. Second, each oil is also certified by an independent tasting panel of human judges, formally trained and accredited to detect even the slightest defects in an olive oil’s taste or aroma. This means that if you ever have a guest for dinner who happens to be an olive oil connoisseur, you can serve them these oils with unabashed pride. You’ll know that these oils have been certified by a panel of the world’s fussiest professional judges to gloriously meet every strict requirement on their list to pronounce it 100% pure extra virgin, the highest grade. When he heard about our website, T. J. sent us three of his new oils, fresh from the harvest, for a taste test. We loved the rich complexity … the vibrant colors that ranged from deep green to golden … and the bright, sunny flavors. They were grassy, herby, fruity, and intense—all at the same time, just like a complex wine. This was the real McCoy EVOO you only get in the best European restaurants and the back-road bistros around the Mediterranean. And then came the oil’s remarkable finish: A distinct “pepperiness” at the back of the throat upon swallowing, the hallmark of the very freshest oil. This peppery tang is due to the oleocanthal, the inflammation-fighting component that can begin to disappear six months after pressing. This is yet another reason to buy your olive oil when fresh. That gentle peppery finish is an excellent indicator of how fresh and therefore how healing the olive oil may be in helping reduce inflammation. Once we tried T. J.’s olive oils, we fell madly in love with them, as did our families. We told this to T. J. He was so pleased that he offered to become our sponsor if we would be willing to share our heartfelt feelings about his olive oils with our audience. To us, it was a match made in heaven, as we were already recommending these oils to everyone anyway. Because these oils are artisanal, they are more expensive than ordinary store-bought olive oils. But we guarantee you’ve never tasted anything like them, nothing even close. And since you can transform up to 30 or more meals with a single large bottle, you may consider them, as we do, one of the best investments you can make in your family’s food budget. In any case, T. J. wants to make it easy for you to decide for yourself by doing your own home taste test. That’s why he came up with his generous “$39-Bottle-for-a-Buck” offer. T. J.’s unique Fresh-Pressed Olive Oil Club is one of the most refreshingly customer-friendly companies we’ve ever come across. Unlike some other clubs, there’s never a minimum commitment or obligation to buy anything. Every olive oil comes with a no-questions-asked, 100% money-back guarantee. And if you ever decide to ask for your money back on a given shipment, you don’t even have to return the oil. Whatever you’ve received is yours to keep with T. J.’s compliments. And his outstanding customer service team graciously takes care of your refund request immediately. First, T. J. and his Fresh-Pressed Olive Oil Club have reserved a strictly limited number—240 bottles (20 cases)—to share with our readers. Problem is, we’ve got many thousands of readers, so these 240 bottles should go very fast, and it’s first come, first served. Also, his $39-Bottle-for-a-Buck offer expires Tuesday, October 31, which will be here before we know it. If you miss it, you’ll have to wait until the next harvest season and hope he repeats the offer. This is the kind of generous, fair-minded offer we like to present to you as our reader for a product we truly love. And it’s an excellent opportunity, perhaps the first in your life, to experience the exceptionally vibrant and delicious taste of extra virgin olive oil when it’s fresh from the new harvest. As we experienced in our homes, it adds whole new layers of flavor and deep-down satisfaction to your crisp salads and veggies, grilled meats, delicate fish, toasted nuts and seeds, and other favorite dishes. When you click on the link below, you’ll see similar comments from many other voices as well. If you’re interested, try a bottle for just $1 and taste for yourself. Previous: New Research – Olive Lovers Enjoy Better Health & Blood Sugar! Pingback: Could These Foods Help You Live Longer?